Our grandmother always kept some form of a diary. Usually it was in book form, occasionally just the space for each day on a calendar, but she always made some notation about her days. She would mention if she went anywhere, if anyone visited, and always, always the weather. Rarely did she just tell the temperature. She had a flair for the dramati c, and that meant that she used phrases like "beastly hot". We use her terms sometimes. This week and last, beastly hot FITS! But summer it is, that's for sure. The first picture is of the turkeys on the roof as a storm gathers. The turkeys are starting to remind me of a gang of teenaged thugs. They bit off most of my green cherry tomatoes the other day, and I *think* they were trying to get protection money out of me. Or chickweed. The wildflowers are knocking themselves out. 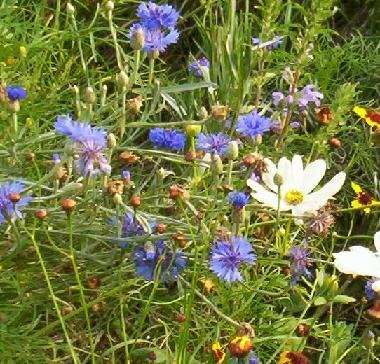 Cornflowers, coreopsis, cosmos, black eyed susan, calendula, and poppies to name a few. They nod as I pass in the heat of mid-day. Their colors seem to stay vibrant in the sun. Bowls, cups, boxes, purses, and decorative pieces pierced to allow light through... using paints, feathers, textiles, beads, polymer clay, woodburning tools, the dremel. Ah yes, another hobby. One of the best things about this house is the sort of communal gardens. I've planted tons of herbs, lots of different sorts of bean, eggplants, patty pan squash, and a couple other squashes, peppers of many varieties, and watermelons. Maryanne and (mostly) Bob have planted corn, tomatoes, cucumbers, and the gourds. 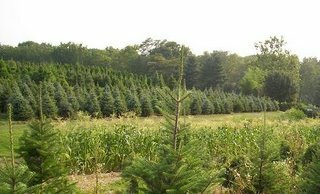 That means that when I have a hankering for some corn on the cob, I just walk down between a few rows of trees til I get to the corn, and take what I need. When they need some mint, basil, or dill, all they need to do is mosey on up to my garden and take what they need. There is something indescribably satisfying about putting on a pan of water and heading out the door to pick supper. I have always loved grabbing a quart or so of wild veggies, but add to that the option of other veggies and herbs, and it is heavenly. We are about to make some pickles from a recipe that someone sent to the Essential Herbal yahoo list the other day. We just need to see if we can find some more dill from a friend down the road. I've been trying hard not to let mine bolt, and now I NEED the seedheads. Figures. We spent several hours the other day freezing corn. We got 46 quarts and plan to make chicken corn soup to freeze in another few days. Then, there will be tomatoes to can, peaches to can, and maybe I'll figure out how to "can" pesto. The Thai and Holy Basils are enormous, beautiful, and so fragrant. Just about when we get that all figured out, the beans will be ripe. And the eggplants. We are having a great time, and already thinking about what we can do next year when we actually have time to plan! Lucky the bay trees aren't bearing berries yet! In the Paper this A.M. I'm Shameless :-). Perhaps you fancy basil, bay leaf, bee balm. Perhaps it's parsley, sage, rosemary and thyme. Maybe you believe tarragon to be a culinary paragon. Whether your favorite herbs are annuals, bi-annuals or perennials, sun lovers or shade-seekers, you have multiple choices when it comes to their uses and where they can be grown. 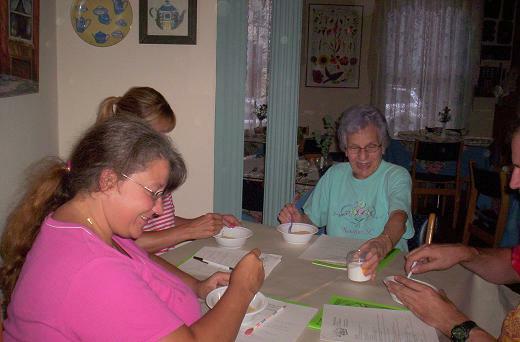 At a recent herb garden workshop held at the Lancaster County Environmental Center in Central Park, master gardener Linda Downs offered a working definition of herbs before demonstrating a variety of their uses. 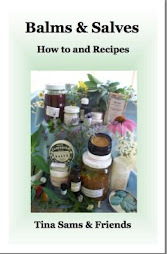 She pointed out that herbs can be used in at least one of four ways: aromatically, ornamentally, medicinally, or in a culinary manner. Herbs also are fun for the average gardener because they are easy to grow. They need no fertilizer or insecticide, and they can be grown in a wide variety of places. In formal gardens or tiny plots of earth, as borders or creeping along rock walls, herbs generally make themselves at home and flourish. If planting space is limited, herbs do fine in containers and can be moved about, or brought indoors. "As soon as an herb can sustain its own growth, it can be harvested for use," said Downs, adding, "don't let herbs blossom unless you're going to use the blooms." To prolong each herb's color and flavor, she suggests gently washing the herb, and then patting it dry before storing it in a zipper-lock bag. She says most herbs will keep several days in the refrigerator (except basil and oregano, which are extremely tender and bruise easily). You can also freeze fresh herbs; Downs suggests 1/4-cup portions in zipper-lock bags. Herbs may be dried in the oven for later use, in cooking or crafts, by placing them on cookie sheets on a low setting with the oven door open. Turn the herbs periodically so they dry evenly. When herbs are crisp and break easily, remove them from the oven and cool prior to storage. Herbs may also be dried in the microwave oven, but Downs points out they may have a tendency to overcook with this method. Tina Sams, of Manheim, remembers being introduced to herbs on foraging excursions with her grandfather. 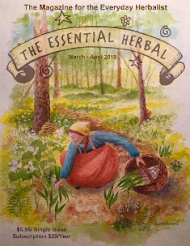 Today, after many years of running wholesale and retail herb businesses, she is a self-proclaimed "herb enthusiast" and current editor of The Essential Herbal Newsletter. 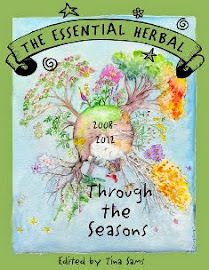 Sams makes a distinction between "normal" herbs and "wild" herbs and points out that all herbs have properties. For example, the mint family, historically known for its refreshing and energizing qualities, also has a soothing effect; while echinacea (purple coneflower), a "wild" herb, is thought to increase immune functions. There are many possibilities for herbs in beverages, said Sams. 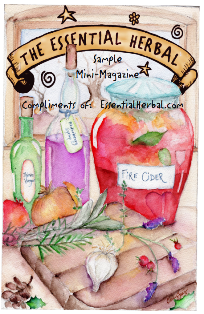 "Herbs can be used in teas (hot or cold), wines, cordials, and even coffee substitutes." Even though she's never made it herself, Sams has tasted a beverage made from roasted dandelion roots and said it makes a good substitute for coffee, with a hint of unsweetened cocoa flavor mingling with a coffee taste. She said chicory also may be used as a coffee substitute. Chamomile tea, the soothing drink that Peter Rabbit's mother gave him after his tangle with Mr. McGregor in the vegetable patch, is the same tea Sams first remembers preparing for her daughter when she was frightened by a thunderstorm. Herbs can be used in cocktails also. There's the well-known mint julep, popular when the Kentucky Derby takes place. The recently featured mojito (Intelligencer Journal, May 5 issue) highlighted mixing rum with mint, and basil can also be added for a layer of tastes. To make the minted ice cubes, fill ice cube trays partially with water and freeze. Set mint leaves on top, fill with more water and freeze solid. Brew double-strength tea and steep, while hot with 2 bunches of fresh mint. When cool, strain out mint and sweeten to taste, chill. Using a non-metallic pot, bring 1 gallon of water up to, but not boiling. Reduce heat to simmer for 30 minutes. Lightly mash the herbs with a non-metallic spoon to help release some of the oils. Remove and let set to cool. Strain through a coffee filter or cheesecloth. Refrigerate until time to use. Will keep for several days. Measure out 2 cups of the infusion to one gallon of weak tea. Add 1 cup of orange juice and serve over ice. Mix up this blend and keep it on hand for any time someone in the house is having trouble unwinding. Serve sweetened with honey, and garnished with a fresh lime slice. Very refreshing! Brew as you would regular black tea. This is so yummy in the morning or when you need a pick up in the early evening. Combine all ingredients in a large pitcher and allow to steep overnight in the refrigerator. Strain and serve with frozen lemon, lime, orange, and herb garnish. There are so many gorgeous things happening outside these days. Sitting out on the deck this morning, drinking coffee and writing an article, it dawned on me that I've landed in a very good place. The passionflower vine had given flowers a month ago, then quit... but today I see a new blossom and there are many more to come. They just don't even look real. I wish my skill with the camera was better. They are just stunning, and they smell delicious too. 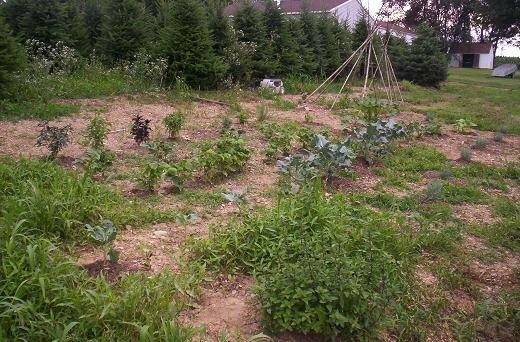 The garden is coming along nicely - considering that it was very late getting in the ground. Looks like I need to learn a little about building supports for the beans, but they don't seem to mind. You can see the row of grosso lavender plants I've put in in the far right of the picture. On the left is a row of different basils. Everywhere I look there are reminders of my mother around this house. All the years of growing up, I remember jokes about my mom having a black thumb. We would buy her flowers, and they would wilt in the vases, remaining in place until someone decided it was time to dispose of the fire hazard. In this house, she took a shine to gardening. I suspect it was my sister's help. 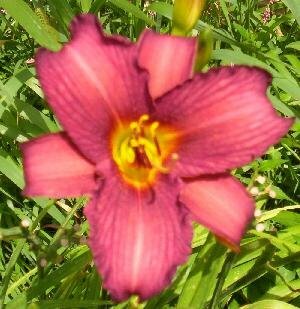 She loved daylilies, holly, butterfly bushes, and climatis vines. These are two of her favorites. 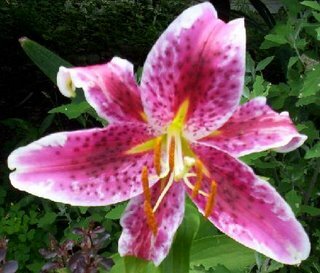 The stargazer is the lone bloom this year so far. Last evening as I headed up the hill from my sister's, there were giant black clouds over the horizon. Storms for me are exciting and energizing, and living atop a hill they are even more so now. I stopped and checked all the veggie plants, and came inside to unplug the computer - just as the electricity went off. That was odd, because the storm hadn't even arrived yet. The wind picked up (the paper says 48 mph, but it seemed much faster), and the air turned that sickly greenish yellow. I can see the horizon in a half circle from the back of the house, and lightning was striking 3 or 4 places simultaneously. The excitement was changing into something else as I headed for the basement, hearing things being blown around outside. From the basement, I could still watch, and this storm was a hum-dinger doozy. Eventually, lightning struck so close that it effected my ability to hear for a moment. My sister told me later that particular strike made her filling tingle (!?!). It seemed entirely possible that the house had been hit, and I kept sniffing for a burning smell that didn't materialize. Whew! That was the worst of it, and the storm continued on it's way south. It's hard to describe the way it feels when there's no power. It made us think about the people in the Gulf States and how they must have felt - or even the people who were flooded in recent weeks. We had it pretty good, after all! My daughter came home, and the lack of power baffled her. At least she'd had dinner..... She flopped around from sofa to chair, finally thinking a nap might make it all go away. Her first experience (at 3) with this sort of thing was so upsetting that it was the first time she was ever dosed with the magical elixir, chamomile extract - which was almost a miracle. At that time, she'd begged for "just one light... PLEASE Mommie!!!" Anyhow, I read until the light became too dim. Then we lit candles, opened windows, and talked into the night while she practiced her guitar lessons. She chose to sleep in the living room for no particular reason. At 6 this morning, the blessed guinea hens squawked me awake (windows open), and the power was still off. Last night while brushing my teeth before bed, I'd discovered that the water was gone too. Yep... standing there in the dark, feeling around for the flow from the faucet, with my mouth foamy from toothpaste, I realized that there was no water. My mouth was VERY fresh this morning. Coffee!!! OH NO! I trudged down to Maryanne's for some contact with the world. As we sat talking about how it would feel to be in a large city with no news, no water, no food, no information, the power was restored and things started beeping and clicking and flashing. So... I learned that pretzels aren't the best dinner in the world, but better than nothing. I'll be adding things to the larder that could be cooked without opening the fridge or using any appliances save the grill. We need more candles. Some in every room, and a radio that works on batteries. Next time a storm like that approaches, I'll fill the tub with water. AND... I'll be encouraging more and more wild foods to grow nearby. This was just a little glitch in the day to day, but a window to see what I need to do to prepare. Still haven't figured out the coffee thing yet, but there are a few ideas coming to mind. Last night we went up to to do the incense class. 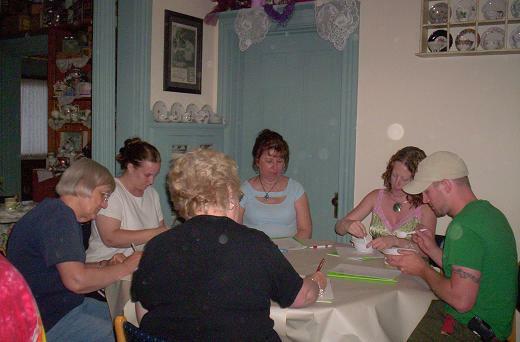 Nancy Reppert was gracious enough to allow us to do the class inside at her tea room, Sweet Remembrances. Since the temperature at 6:30 was 91 with extreme humidity, I was quite relieved to be in the air conditioning. wouldn't smell good when burned. The big surprise of the evening was finding out that Rue gives off a scent like coconut when burned! There was an orange tree in bloom, and as luscious as the blossoms smelled, there was almost no scent when burned... and that was exactly the point of our going outside and burning things. Well... that and the fact that it was really fun, and The Rosemary House has such incredible gardens with so many smelliferous things to burn. While making incense cones from the various powders is one of my favorite classes to teach, it is a fairly obscure topic and sometimes the classes don't fill up - requiring cancellation. 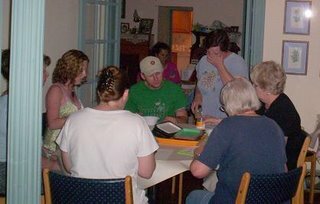 We had 10 eager participants last night, and that was really fun. It is always interesting to see the many different shapes that are all "cones". Everyone got to make a batch of incense in either sandalwood/benzoin/lavender, or some chose to leave out the lavender. They all did a great job. As usual, classes start out a little bit "tight", and by the time we are through everyone has dirty hands and feels like we know each other. One other tip discovered last night.... Susanna is Mom to kids that are young enough to require wet-naps. Soap and water doesn't effectively remove the tacky resins from the hands after making cones. But wet-naps work in a snap. Pictures were promised, so pictures there are. We'll start with the office. It still needs a bit of work, and there is another wall full of shelves holding past issues, but we are close. Right now, as I write, I can look out over the hill below and watch the Guinea hens marching - one per row through the trees, each one gathering bugs and walking at exactly the same speed as the others. We are giving a class on making incense tomorrow at The Rosemary House in Mechanicsburg, and it will be so simple to reach over, get the supplies needed and be prepared. What a difference that will make! The first picture is leading into the office from the house. The second is facing the back. 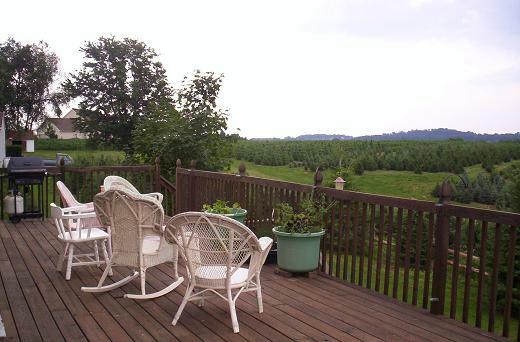 In the back, there is a deck that goes the entire length of the house. 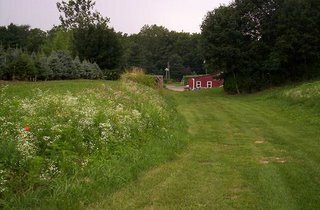 From there, it is possible to see for several miles, including the road leading to the house. Silos stud the landscape, and hills and trees. The sky is enormous. After an afternoon in the garden, the deck is the perfect place to sit with a cool glass of tea and look at the results of that labor. The garden went in late. We just put up the teepees for the Mosteller beans that Barb and Fred Will from Sugar Grove Herbs gave us at the festival at Alloway Gardens Art and Herb Faire. They are getting ready to climb. The only thing we've lost to (I think) woodchucks so far has been the borage, which had been supplying pretty blue blossoms to garnish summer dishes. The row of grosso lavender is not really visible this year, but next year it will make a nice hedge. The weeds are doing exceptionally well. This is the path that leads to my sister's. The little red building is much larger than it appears. Inside, it has four separate areas/rooms. One is for storing finished soap and shipping - and the front of that section is also the office and jewelry area, one is the kitchen/lab, one is Bob's workshop, and the last is the bay for farm equipment AND baby bird nursery. The house is off to the right. Just behind the building, you can almost make out the pergola that he constructed this year. 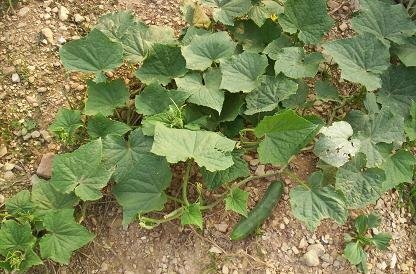 It is entirely covered with gourd plants. Looks like we'll be playing with another craft next spring. Along the path, there are swaths of wildflowers. 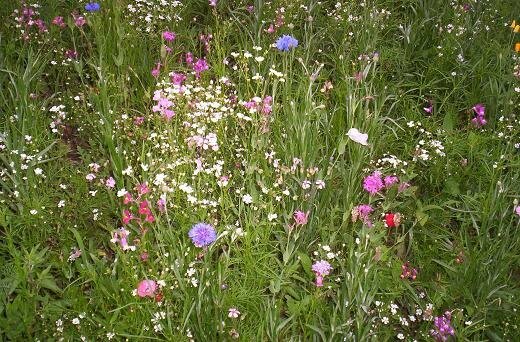 Besides the ones in the picture, there are gangs of small poppies in every color imaginable, zinnias are starting to bloom, and the cosmos are really thinking about going wild. 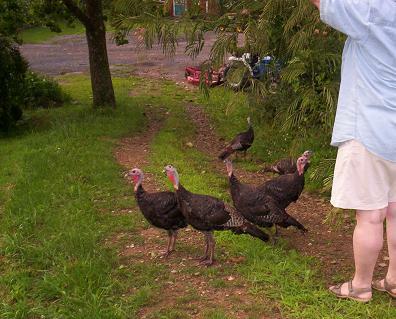 And then there are the wild turkeys. Wild, I say! There are 11 of them, all but 3 male. They were raised from hatchlings, and when they were too young to be loose, we used to gather chickweed to feed them. Now they follow us around, thinking that anything we might be picking is far more interesting than what they can find on their own. These were all taken before, during, and after a wild storm that included hail. Weather changes very quickly here. One minute the sun is shining with booming off in the distance, and the next minute clouds roll in and the rain starts. Guess I'll just have to get used to listening closer. 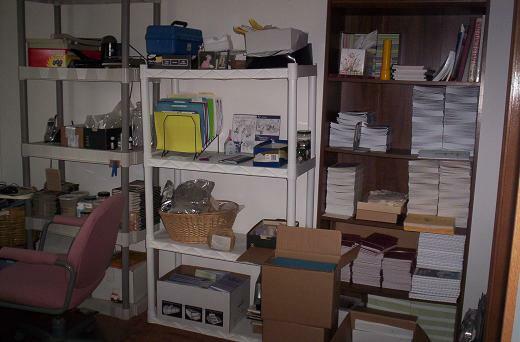 We've been in our new home/headquarters for a few days now, and everything is falling (or being shoved) into place. The office was the very first thing we moved in order to retain some semblance of sanity, and for the first time, everything is in one place. It is hard to describe how much easier it is to be able to ship an order without looking all over the place for the items, the shipping materials... and where is a darned pen!?! So here we are. No pictures yet, but let me tell you a little about it. 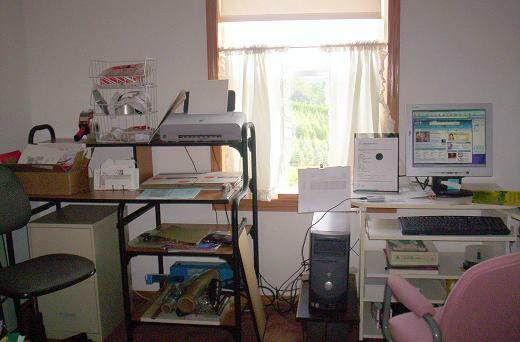 First, the space is more than double without counting the basement. The business is completely separated from the rest of the house. 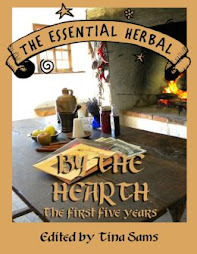 The first year of The Essential Herbal, everything could have fit into a sturdy box, but as time went on and we put out more issues and more books, it had infiltrated everything. Scale in the kitchen, herbs in the hall closet, boxes of books stacked in the bedroom, shrinkwrapper under the bed, mailing supplies in the CD rack.... typical home business. Now everything is together. There is lots and lots of space to plant. Lots of space. Before we even started moving, the garden went in. 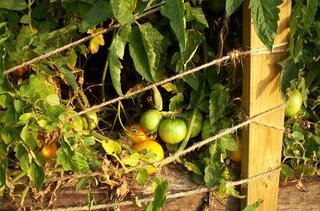 Several different heirloom varieties of tomatoes and peppers are getting ready to ripen. The squash are flowering, 3 kinds of heirloom beans are putting out pods, and the 2 different eggplants are seriously considering budding. We were too late with the spring peas, so I'm saving them for seed next year. 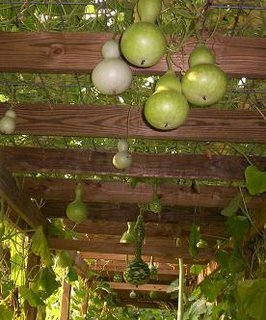 Honeydew melons are in containers on the deck, and a couple of watermelon plants are on the split-rail fence. The Jerusalem artichoke patch is filling up nicely. I've been warned that they'll spread, and I'm ready! We also put in a row of lavender for future distillation, 4 different basils, and all the typical cooking herbs. A few helichrysum plants are growing for distillation experiments later as well, and we stuck an elderberry bush in, hoping it will spread. If not, I'll add to it. Well that's enough for now. Maybe I'll be able to post a few pictures next time. See ya! Here's another great craft. I've used this process on shirts, jeans dresses, totes, and even stationery. There are books on the subject, but as usual, I'm a trial and error kinda gal. 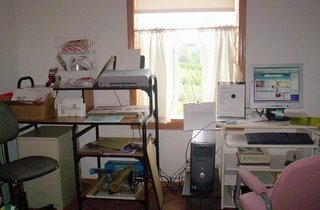 To get the process working, you may want to start out working on regular paper, and then go to cloth or fancy paper when you're sure of yourself. You'll need:Pressed weeds and flowers - These need to be flattened and mostly dry, but not brittle. You can use brittle stuff, but need to be much more careful. Gather what you'll want to use and stick it into old phone books for about a week. Queen Anne's Lace is STUPENDOUS!! !Crafting Paints - the kind used for stenciling.Paper towelsSmall craft paint brushes or strips of spongeBrayer (I use a 2" or 3" roll of packing tape)Begin by painting the dried weed on the side that will touch the fabric. Not too much, or it will ooze. Place the weed face down, cover with paper towel (or newspaper) and roll the brayer over it to be sure that all areas have been covered. Remove carefully and admire your work. The same weed can be used several times if this is done carefully. My all time favorite shirt, I made for my little Molly. It said "Growing Like a Weed" and had all sorts of herbs and plants in many different colors on a little white T. Beside each one, I'd carefully written the name of the plant using black paint with a very small brush, although one could most likely use a permanent market. It was awesome. Teenaged girls liked one we did that said "Wild Child", and was covered with all sorts of weeds.Some favorite plants to use? Sage is lovely, along with bleeding hearts, tarragon (looks like seaweed! ), lavender spikes, thyme, dill -although it requires tweezers - monarda, ginkgo leaves, maple seeds, oh it goes on, and on..... Certainly the best ones have veins, texture, and/or deeper sorts of structure. 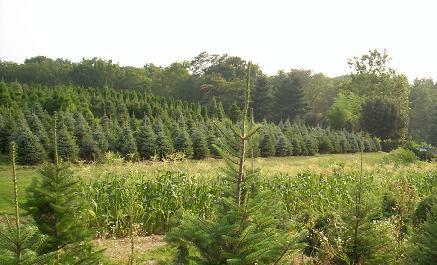 Wispier plants like southernwood are very pretty, while violet leaves would wind up being a large shape with very little detail – no texture. To make the piece colorfast, it must be ironed using a pressing cloth and then placed in a hot clothes dryer for ½ hour. Most of the paints have specific instructions on the labels. This procedure is great fun and can be used on scarves, dresses, jackets, FURNITURE!! !, walls, or anyplace your imagination takes you – and judging by our mail….that could be pretty much anywhere. Well, now that I’ve written about it, there are all sorts of projects floating in my head. Guess I’ll wander out and see what kinds of weeds and plants I can get started on pressing. There seems to be an abundance of white yarrow and chicory, and the thyme is blooming in the garden. 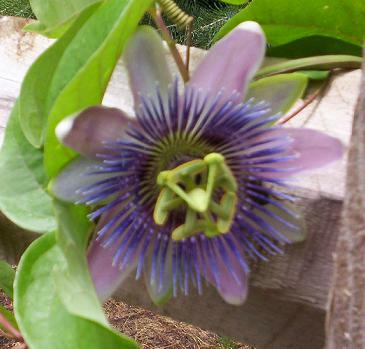 They will be great, along with poke blossom spikes, lavender (of course!!! ), and bergamot. Melilot, catnip, mugwort, burdock, toadflax, chamomile, St. John’s wort are all within a few feet of the backdoor. Oh – oh…. The newsletter could be a little late this issue.